The world contains objective causal relations and universals, both of which are intimately connected. If these claims are true, they must have far-reaching consequences, breathing new life into the theory of empirical knowledge and reinforcing epistemological realism. Without causes and universals, Professor Fales argues, realism is defeated, and idealism or scepticism wins. Fales begins with a detailed analysis of David Hume's argument that we have no direct experience of necessary connections between events, concluding that Hume was mistaken on this fundamental point. 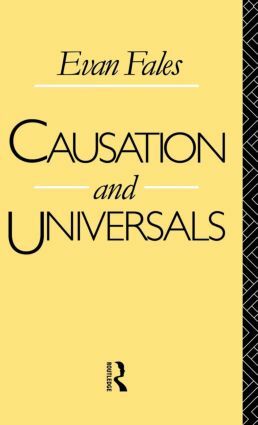 Then, adopting the view of Armstrong and others that causation is grounded in a second-order relation between universals, he explores a range of topics for which the resulting analysis of causation has systematic implications. In particular, causal identity conditions for physical universals are proposed, which generate a new argument for Platonism. The nature of space and time is discussed, with arguments against backward causation and for the view that space and time can exist independently of matter or causal process. Many of Professor Fales's conclusions seem to run counter to received opinion among contemporary empiricists. Yet his method is classically empiricist in spirit, and a chief motive for these metaphysical explorations is epistemological. The final chapters investigate the perennial question of whether an empiricist, internalist and foundational epistemology can support scientific realism.